Traditional English-style landscape design combines a love of nature with a classical aesthetic that invites the imagination on secluded strolls through secret gardens. Common features include ponds, cobblestone pathways, garden benches and sculpted hedges, with plants like hydrangea, boxwood, delphinium and English rose bushes. Japanese gardens combine carefully balanced elements to inspire tranquility and peace. Plants used in traditional Japanese landscapes include trees like atlas cedar, Japanese maple and cherry and flowering plants like star magnolia, azalea and chrysanthemum. Natural pea gravel walkways, rock gardens, bamboo fountains and koi ponds are just a few of the features that make this type of garden space a meditative retreat. Inspired by the casual elegance of the classic Mediterranean villa, this landscaping style combines formal elements like tiered fountains, columns and statuary with luxuriant plants that abound in texture, fragrance and color: trailing clematis, lavender, pear, olive and citrus trees, sage, rosemary and cypress. Colonial landscaping is characterized by symmetry and classic functional design. Large trees like magnolia, southern live oak and sugar maple create an impression of comforting permanence, emphasized by traditional features like white picket fencing, arbors and paved stone paths. Flowers that complement colonial style include hydrangea, phlox, lilac and echinacea. 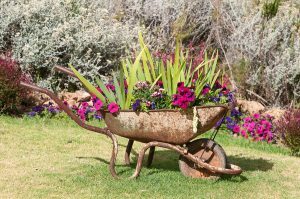 Whether you’d like to create the perfect English garden or want your landscape design to be more eclectic, consider consulting a professional landscaping company before you get started. You should be able to find a business that can help you through every step, from selecting plants that will thrive in your region to designing a layout that fits your needs and vision.